I Heart Cooking Clubs is celebrating Mexico's Independence this week, cooking celebratory dishes from Rick Bayless. In October, we're switching to Indian cuisine from Madhur Jaffrey. But for now it's fiesta time, babe. I lean towards the usuals. The old stand-bys. Beans and rice. These Simplest Fried Beans and Green Poblano Rice are far from a snooze fest, though. The beans will most definitely make my top 5 from Rick Bayless. The slivers of onion and the chopped parsley are my lame attempt at making these beans look festive. 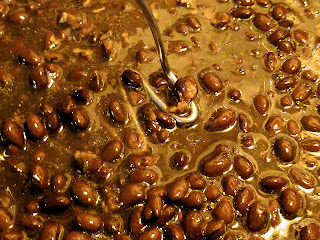 Simplest Fried Beans from Rick Bayless: Smoky from the bacon with just the right amount of toasty garlic and creaminess. I can't tell you how many times I've made this recipe. I can't tell you how many times I've come up with excuses for Mexican night these past few weeks just so we could have these beans again. It's quickly using up my bacon fat stash, but it's worth it. This recipe differs from my usual in that I add some chopped onions along with the garlic and I thin the beans with evaporated milk. Have to admit I like Rick's version more. The bean picture above...ummm...so...look. Mashed up beans just aren't all that attractive. I'm telling you, though, it would be a mistake to shrug these off. 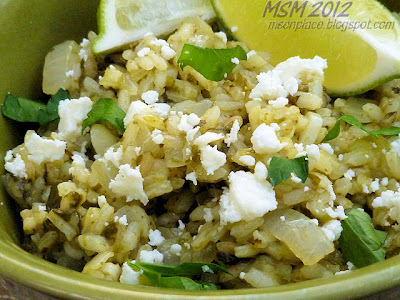 Green Poblano Rice from Rick Bayless: I made this a while back for "Green Week," so the details are fuzzy. But I do clearly remember feeling weird about boiling the poblanos. My gut told me they should be roasted. So I did a little of both--half following RB's directions and half following my gut. What can I say? I'm fair like that. The rice was tasty and we enjoyed it with a sprinkle of feta and lime juice over the top. See more Mexican celebration dishes at I Heart Cooking Clubs. Measure the oil or bacon drippings into a skillet and set over medium heat. Peel garlic and put through a garlic press or finely mince. Add to the skillet and cook for 1 minute. Pour in the beans. Mash with a bean masher, potato masher, or the back of a spoon until almost smooth--about 10 minutes. Cook, stirring constantly, until thick enough to barely hold shape in a spoon. They shouldn't be soupy or thick. Taste and season with salt if needed. In a 2-quart saucepan, combine the broth and the uncooked chile, bring to a boil, then partially cover and simmer gently over medium to medium-low heat for about 10 minutes, until the chile is very soft. Pour the chile mixture into a food processor, along with the roasted poblano, and process to a smooth puree. Season with the salt. Wipe the pan clean, add the oil and heat over medium. Add the rice and onion, and cook, stirring regularly, until the rice is chalky looking and the onion is soft, about 5 minutes. Stir in the garlic and cook a minute longer. Add the warm (or reheated) chile liquid to the hot rice pan, stir once, scrape down any rice kernels clinging to the side of the pan, cover, and cook over medium-low heat for 15 minutes. Uncover and check a grain of rice: It should be nearly cooked through. If the rice is just about ready, turn off the heat, re-cover and let stand for 5 to 10 minutes longer to complete the cooking. If the rice seems far from done, continue cooking for 5 minutes or so, retest, then turn off the heat and let stand a few minutes longer. Fluff with a fork and scoop into a warm serving dish. Squirt the juice of about half of a lime over the top. Sprinkle with feta and serve. Are you going to cook Indian food with us? I've been wondering. Tony has informed me that he doesn't want any part of it. He "thinks" he won't like it. We'll have to see about that! I want this rice so bad! I love feta, but with poblanos - WOW! 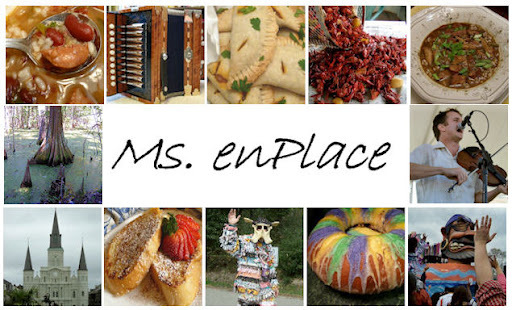 Yum squared Miss Michelle. This looks great and I would eat this now .... and it's not even 9am yet! LOL - pinned it! I'd roast too! 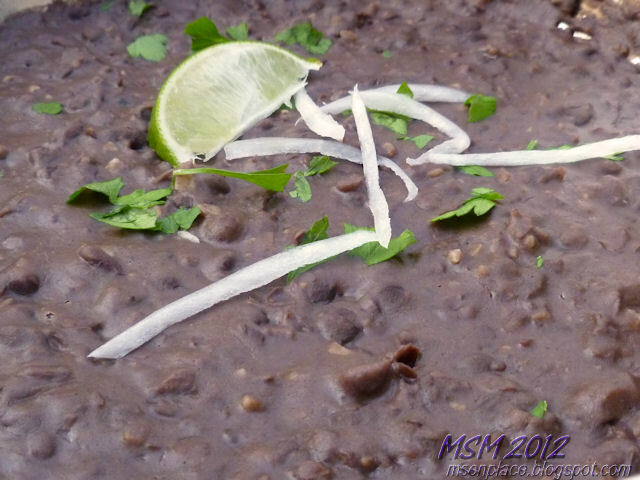 Beans and rice - perfect way to sum up classic Mexican fare. Rick has given me a real appreciation for what can be done with beans - and I am loving poblanos! Your beans and rice look so delicious! 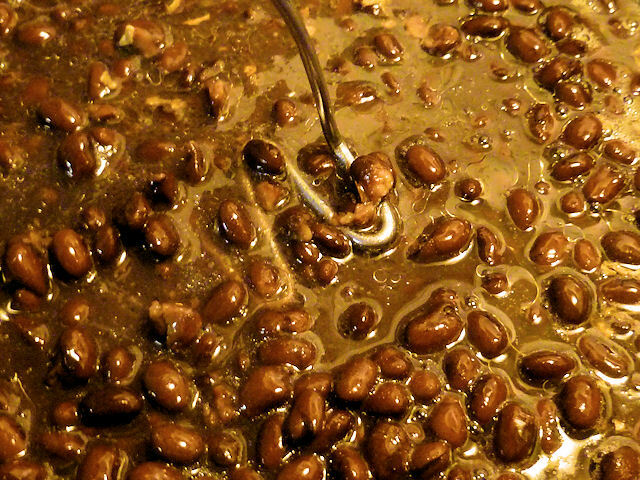 I think I will put some dried beans in the crockpot today so I can have them done and ready and waiting in the fridge. I've been on a poblano kick lately and the rice sounds just perfect. Looks wonderful to me! Don't poblanos go with just about everything? Love those lil suckers! Beans and rice are always a good way to celebrate. I am all for roasting the poblanos too. 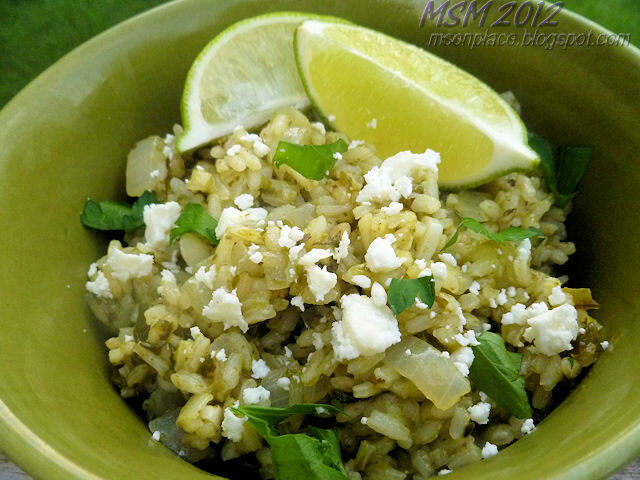 Beans and rice, a perfect meal for any celebration! Looks delicious!